Hvar Town is meant to be one of Croatia’s top party islands. Hvar is a sunny haven which offers you beautiful views, glorious architecture and nice (if horrifically rocky) beaches, but most of the islands younger tourists go there for the promises of crazy beach parties, open air clubs and cheap drinks. This small island has referred to as the ‘new Ibiza’ in the past, so you’d expect Hvar nightlife be pretty impressive. I’m here to lower your expectations and tell you about the downsides that you may experience if/when you go to Hvar. I’m not saying don’t go or that you’ll have a bad time but if you are looking for a cheap place full of amazing clubs then you may want to look somewhere else. I’m not here to hate on Hvar. I liked Hvar. Croatia’s absence of sand is a little upsetting (it can be to make yourself comfortable on an assortment of small rocks! ), but the water is nice, the views are even better, and Croatia’s sun is bound to give you that slightly peely tan you’ve always wanted. Hvar is next to a bunch of smaller islands, and one of the best things you can do in Hvar during the day is hire a boat with some friends and ride over to visit the neighbouring islands for some swimming, sunbathing and wine in the sea. Anyone is allowed to rent out these boats regardless of experience, but if you stay in a hostel you may be able to sweet talk a pro into doing it for you. Hvar also has a nice castle and the walk up to it will not only burn off a significant number of calories but it will also give you some fabulous picture opportunities. You have to pay to go into the actual castle, but most people are only there for the view. The beach bars are pretty overpriced, but there are cheaper ways to drink and sunbath. The rocky sections of beach around where Hula Hula is are full of sun beds, and if you are brave enough to climb down the rocks and actually reach the beds then I assume you can use them for free. Hvar Town also has some awesome hostels where even the shyest and most socially awkward amongst you are practically guaranteed to meet new people. The hostel I stayed at had it’s own bar, there was a fantastic view of the sea, it was really close to the main town, and all the doors doubled up as mirrors so you never have to wonder what your hair is doing. 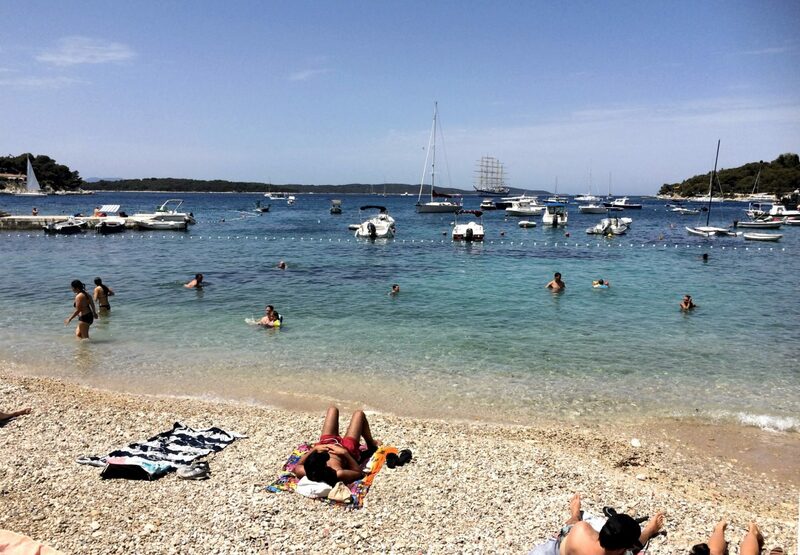 Hvar is marketed as a party destination, but it’s popularity is also it’s downfall. Hvar Town is not a big place and it doesn’t have that many venues, but during the summer months it is rammed with tourists on a good day and literally impossible the rest of the time. There are two nights a week (I believe they are Wednesday and Saturday) when all the boats come in and a huge crowd of new tourists turn up to party. The result is that you can’t physically fit inside the humble seafront clubs, you can’t even enter the smoking alleyway, and the main street is full of forlorn looking lost tourists. You will lose everyone you came with in a matter of seconds, and you will spend the rest of the night fighting to reach the bar only to be handed an obviously watered down drink. Maybe you like spending your nights squashed against a wall with no prospect of drinking, dancing or breathing, but it’s not everyone’s idea of a good time. To be fair the less busy nights are better and you can get some reasonable deals, but even then the mainland clubs aren’t anything to sing about. Perhaps I’m missing something and there’s a whole other area that I never found, and maybe I have no idea what the ‘real Hvar’ even is, but from the experience I had I’m just not sure what all the hype is about. It was more of a bar vibe then a crazy island club scene, except the bars are desperate to be clubs. One of Hvar’s biggest selling points is Carpe Diem, but the problem is that the sea tends to be quite choppy and more often than not you won’t actually be able to get there at all because the boat won’t be going out. I was unfortunately unable to go to Carpe Diem at all because the boat either wasn’t operating or I didn’t think it was. I heard some people saying that it didn’t really live up to the hype either, but I’ll let you be the judge of that. The biggest problem with Hvar is that it is way overpriced for a frugal backpacker. It has been described as an ‘elite’ island, so if you’re after sunset cruises and expensive wine you’re sorted but if not you may want to try a cheaper destination. Hula Hula is a really nice rocky beach bar which gives you great views of the sunset and you have the opportunity to lie on your sun bed and have cocktails brought to you all day, but it is crazily expensive and the people who stay there for longer than 45 minutes are either ridiculously wealthy or have just given up. Hula Hula one of those places that you need to say you’ve been to, but you probably won’t want (or at least be able to) stay for very long. The staff are also pretty snooty (too snooty to be wearing flip flops anyway) and the actual vibe doesn’t necessarily match the chilled music they keep playing. The problem with Hvar is that it’s too popular for it’s own good and that means that the bars are rammed, the prices are crazy and people are so determined to have a good time that the streets are full of lost souls trying to find somewhere to go. Hvar is more of an ‘elite’ destination than a cheap backpackers paradise, so whilst you’re bound to enjoy your time there and you should definitely stop by, if you’re looking for a good night out then you might have better luck in Split.